The one-year anniversary of this blog (blogiversary?) slipped by on February 13th without me really noticing it. Sitting down at the computer to write a blog post before I shut down my computer and crawl into bed has become a part of my daily routine. It has given me a chance to reflect on the things I’ve worked on or that have interested me. On a more practical note, blogging has allowed me to keep track of what I’ve done, where I got the recipe/instructions/pattern, and how it turned out — and in a searchable format. I can’t count the number of times I’ve grabbed my phone and used the search function on this blog as a quick memory aid. 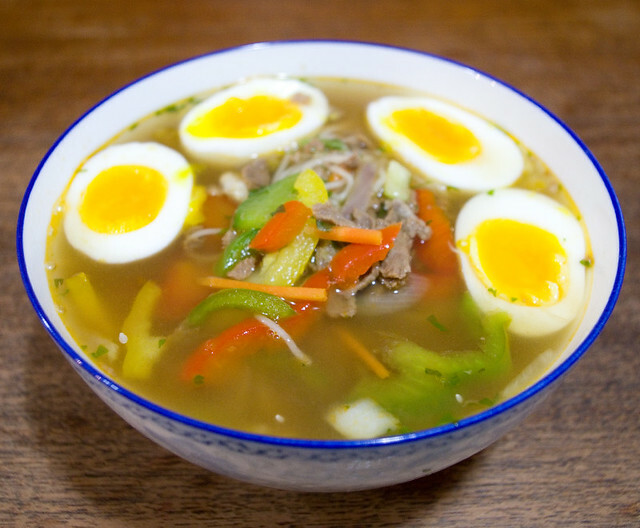 Kirkland Asian Beef Noodle Soup kit with added soft-boiled eggs. It looks reasonably appetizing, but it tastes powdery and somehow more artificial than an instant ramen packet. Thumbs down from me. Have I learned anything over the last year? Well, I’ve expanded my cooking skills considerably. I no longer rely on the same repertoire of a few reliable recipes day in and day out. I mean, of course I still have some that I go back to over and over again, but that’s interspersed with trying new things. And trying new things has started to help me get over the fear of failure when learning. One of the great things about cooking is that even if you mess it up, it’s only one meal. It may seem like a big deal at the time, especially for the more difficult dishes, but in the grand scheme of things it’s not so bad. The important thing is that I learn from my failures. 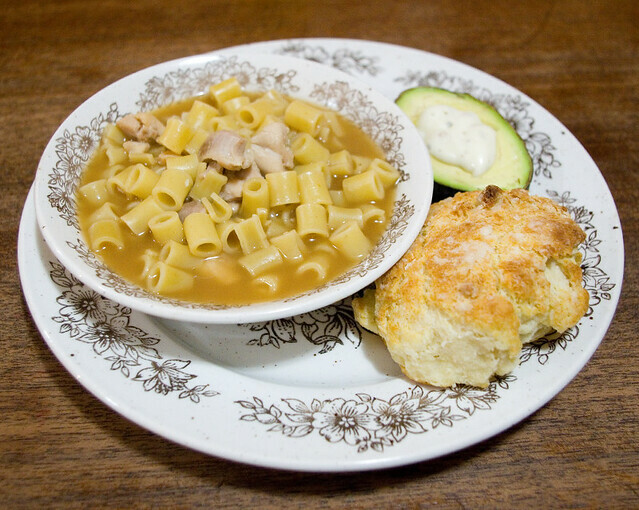 Homemade chicken noodle soup with half an avocado filled with ranch dressing, and a Dad’s Biscuit. I may have added a few too many noodles to the soup this time, but it tasted fine. I’m also enjoying how blogging has pushed me to try new foods and new techniques — and that, by extension, has influenced how my children experience the culinary world. So long as it’s not burned to a crisp, my husband will eat just about anything so long as he doesn’t have to cook it. (That’s not to say that he doesn’t have his preferences, but he’ll still eat stuff he’s not fond of.) But my kids, though, are more resistant to culinary change. They’re not super-picky eaters (and boy, have I heard stories about kids like that), but they tend to complain when a food isn’t one of their favourites. I think that exposing them to new foods so often now has taught them that just because a food is new, that doesn’t mean they won’t like it. There’s still resistance there, but not at the same level as this time last year. And I have to say it’s heartwarming when I overhear my kids brag to their friends about my cooking — and then try to persuade their friends to try something new. A quick dinner of fried rice using whatever leftovers were in the fridge. 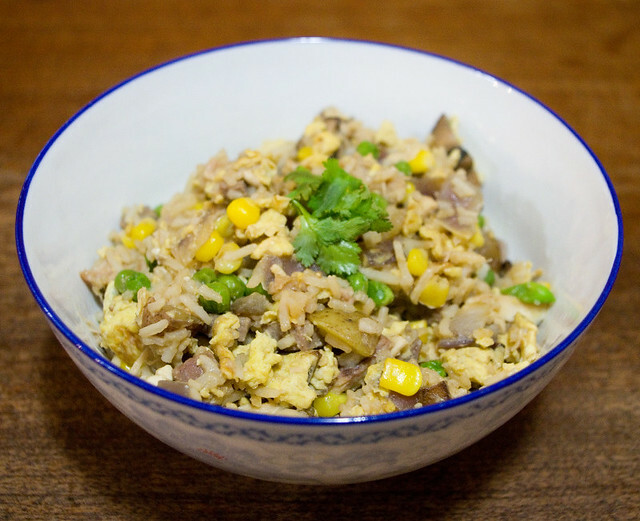 Ingredients included roast chicken, roast beef, red onion, green onion, potatoes, corn, peas, mushrooms, garlic, and eggs, cooked together with a bit of soy sauce and miso broth. Tasty. Where do I want to go from here? Well, I have a whole list of dishes I want to try, and a stack of new cookbooks from Christmas that I’ve barely cracked. My friends bought me a copy of The Sioux Chef’s Indigenous Kitchen by Sean Sherman (2017), and I am highly intrigued. I also want to dive into How To Cook Indian by Sanjeev Kapoor (2011), which my husband bought me. Although these books are from completely different cultures and corners of the globe, they do share a commonality in that I’ll have to learn where to source some of the ingredients that are less common around here (or common, but only seasonally). I also want to improve my breadmaking skills, and learn to make rum balls and pavlovas. 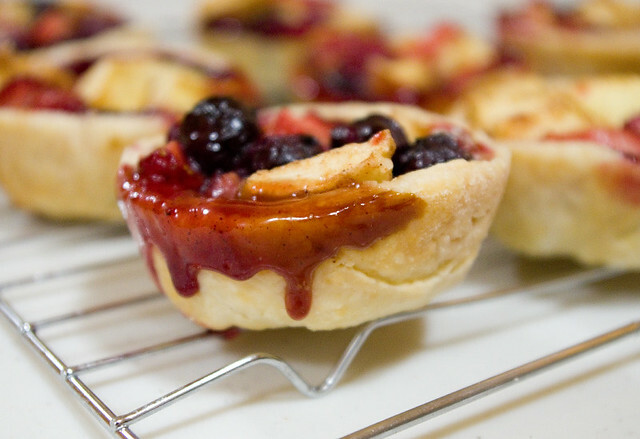 Fresh fruit tarts made from crust leftover after making full-sized pies. The filling is basically a peeled, chopped apple, strawberries, and blueberries, with a bit of white and brown sugar and a dash of cinnamon. Mostly, I just want to keep learning. There is so much out there to try! I want to push my personal boundaries when it comes to cooking, and try new techniques when it comes to handicrafts, and start my own small business when it comes to thrifting. I want to challenge myself. I want to expand. I want to grow. And I want to keep writing about it.